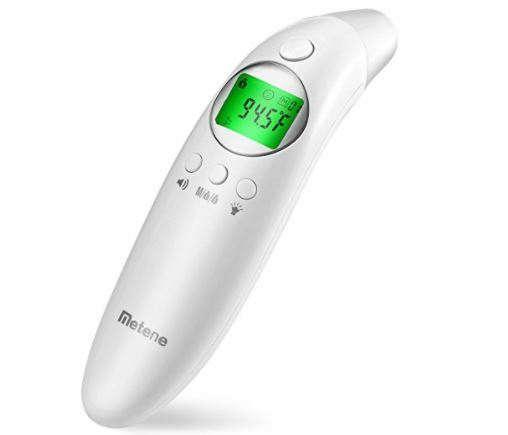 Hurry over to grab this Metene Medical Forehead and Ear Thermometer for Fever, Non-Contact Digital Thermometer on sale for $15.89 with the coupon code: FJB4QLN7 at checkout. -FOREHEAD AND EAR THERMOMETER:Install the forehead cap, and press the button of scan directly to measure the forehead temperature;Remove the forehead cap, and the thermometer enters into the ear measuring mode. -PROFESSIONAL MEDICAL EQUIPMENT:Metene Digital thermometer is *CE and FDA approved since it it trustworthy and has earned the accolades of professionals.All the materials used in the Metene thermometer have passed the non toxicity testing of the international regulations. -Memory storage function：The design of 32groups of data storage for each user in total and query function.can save measurement mode and temperature measurement of your value for query. -You’re protected by a 100 day, no-questions asked money back guarantee and world class customer service.